MELBOURNE: More than 100 homes burned down in a leading Australia tourist area as Christmas Day bushfires remained out of control and dangerous on Saturday, with officials predicting more blazes to come in the hot southern summer. While around 150 firefighters battled the flames along parts of Victoria state’s picturesque Great Ocean Road, teams moved in to assess damage from fires that had lit up the night sky along the coast on Christmas evening. 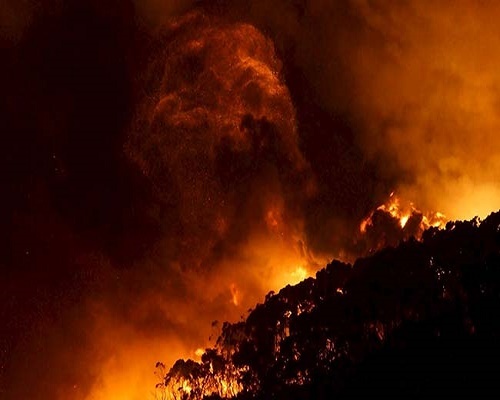 A spokeswoman for the state’s emergency services said 85 homes had been confirmed burned in the community of Wye River and another 18 in nearby Separation Creek, for a total of 103 in the two townships located about 120 kilometres (75 miles) southwest of Melbourne. Top emergency officials warned that dry conditions posed a threat of more fires for the Great Ocean Road area and the rest of Victoria. “This fire doesn’t go away. This fire is a fire that will remain with potential to burn in January and February this year,” Craig Lapsley, the state’s emergency services commissioner, told a news conference. The Great Ocean Road is one of Australia’s biggest tourist draws with its spectacular scenery and bizarre rock formations just offshore in the Southern Ocean. It remained mostly closed to traffic on Saturday during what is typically one of its busiest times of the year. Although an evacuation alert was lifted for the popular tourist town of Lorne and rain overnight had helped the firefighting operation, officials said the fires were far from out. State Premier Daniel Andrews surveyed the area from the air and commended emergency services, noting that there had so far been no loss of life. Meetings were held on Saturday for hundreds of victims urgently moved out of affected towns on Friday, many spending Christmas night in hurriedly organised shelters. Some of the buildings destroyed were holiday homes. Andrews said financial grants had already been issued to help those who had lost their homes. The fires started with a lightning strike on Dec. 19 and, fanned by winds, have already burned more than 2,000 hectares. Walking tracks in the nearby Great Otway National Park have been closed to the public as the fires reached the park itself. The disaster is the latest of a string of bushfires to hit Victoria and other states in recent weeks.